Denied by United States Congress. Became part of State of Oklahoma in 1907. The State of Sequoyah was a proposed state to be established from the Indian Territory in the eastern part of present-day Oklahoma. 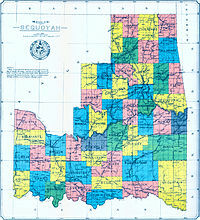 In 1905, with the end of tribal governments looming (as prescribed by the Curtis Act of 1898),  Native Americans of the Five Civilized Tribes—the Cherokee, Choctaw, Chickasaw, Creek (Muscogee), and Seminole—in Indian Territory proposed to create a state as a means to retain control of their lands. Their intention was to have a state under Native American constitution and governance. The proposed state was to be named in honor of Sequoyah, the Cherokee who created a writing system in 1825 for the Cherokee language. ^ a b c d e Mize, Richard (2009). "Sequoyah Convention". Oklahoma Historical Society. Retrieved May 10, 2016. ^ "Museum of the Red River - The Choctaw". Museum of the Red River. 2005. Archived from the original on 15 June 2009. Retrieved 4 August 2009. ^ "THE STATE OF "SEQUOYAH."" (PDF). The New York Times (Archive). 5 October 1905. Retrieved 4 August 2009. ^ Wilson, Linda D. "Posey, Alexander Lawrence (1873—1908)," Encyclopedia of Oklahoma History and Culture, 2009. Accessed March 1, 2015. ^ "Enabling Act 1906". Chickasaw History & Culture. Chickasaw.TV. ^ Everett, Dianna. "Enabling Act (1906)". Encyclopedia of Oklahoma History and Culture. Archived from the original on November 23, 2011. Retrieved January 10, 2012. ^ "Today in History: November 16". loc.gov. Library of Congress.